Anabaptism found its way into Thuringia about 1527 apparently from Franconia, where Hans Hut was working. The first head of the Thuringian Anabaptists was Hans Römer, a furrier of Eisenach. After him his disciple Ludwig Spon of Ershausen became "the soul of the movement" in this area. The preacher Alexander, who also baptized in this region, was seized and beheaded in Frankenhausen in 1533, "one of the noblest characters of Anabaptism." Early in May of that year seven Anabaptists including Ludwig Spon were imprisoned in Mühlhausen and Treffurt after they had been warned to give up their conventicles in the neighboring villages. They declared that they would rather die than recant or betray their brethren. They would probably have been executed if Philipp of Hesse, who had jurisdiction over the region with the dukes of Saxony, had not objected. The seven prisoners were instructed for a while by Balthasar Raidt, the pastor at Hersfeld, and released after half a year. Almost at once the Mühlhausen Anabaptists began to propagandize for their cause in the wider vicinity of the city. They had good success in the village of Neunleiningen, ten miles east. A number of men and women were imprisoned and tried in September 1534. Alerted to the presence of Anabaptists in Mühlhausen by the statements of the prisoners, persecution began anew in the city. A citizen of Mühlhausen, Klaus Scharf, on the rack betrayed the names of his brethren; they were arrested, but soon released when the city council was convinced of their innocence. Klaus Scharf was also given his freedom, but again held Anabaptist meetings in his house. A center for the Anabaptists in the city was for a time the home of Barbara Meissrod, who had been baptized in the fall of 1534 by Heinz Kraut. 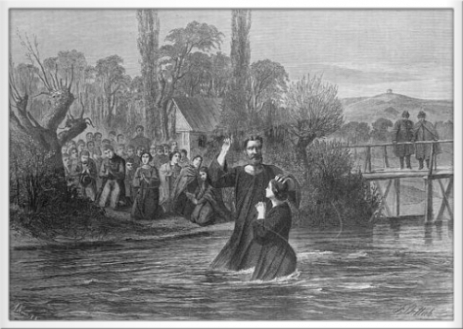 In early 1535 Peter Reusse baptized several women of Mühlhausen. Meetings were also held in the neighboring Gunzelhof, where as many as 20 gathered at one time and where the preacher Mattes baptized. Anabaptists of the city also met in the forests. a Mühlhausen girl, were put to death at the same place. Four were driven from the city. This procedure of terror apparently wiped out the Anabaptist movement in Mühlhausen. But after the death of George in 1539, when the Reformation was introduced into the city, the Anabaptists also became active again, especially since Sebastian Thiel, the pastor of Niederrode near Mühlhausen, was not unfriendly to the movement. Thiel was, to be sure, punished for his attitude at the instigation of Justus Menius, who had been put in charge of the reform of the church in 1542, but the Anabaptist movement nevertheless revived to the sorrow of the Eisenach Superintendent, who spared no effort in speaking and writing to eradicate the movement during his two years of office. The preachers were required to preach against them from the pulpit and pray for their conversion. He wrote a new polemic, Von dem Geist der Widerteuffer, which he dedicated to the city council on 3 April 1544. This booklet had the desired effect. Several citizens and peasants were ordered arrested and cross-examined by the preachers. Those who refused to recant were imprisoned; among these was Ludwig Spon, who was once more at the head of the brotherhood. A year later six brethren were examined, among whom was Christoph von der Eichen, who was repeatedly imprisoned and escaped death only through Philipp's intervention. He was banished from Mühlhausen with his family, but kept reappearing in the city and the vicinity, obviously a leader, whereas Ludwig Spon disappeared from the records. Until the 1570s a small remnant seems to have maintained itself under the leadership of Christoph von der Eichen, who caused the authorities of Mühlhausen much concern. The complaints of the pastors were unceasing. In 1564 the governments involved made it mandatory to take serious steps to wipe them out. On 16 September Anabaptists were summoned to a cross-examination, of whom 12, including Christoph von der Eichen, appeared. They were examined at length and strictly admonished to desist from their "horrible error," but in vain. Christoph von der Eichen was questioned a number of times and was finally executed as an "arch-Anabaptist" at Langensalza in the early 1570s. The same fate befell the last Anabaptist of whom there is record in Mühlhausen, Hans Dohn of Lauterbach, who stayed with his brother in the vicinity, and whose doctrine was of a strange dualistic and anti-Trinitarian nature. 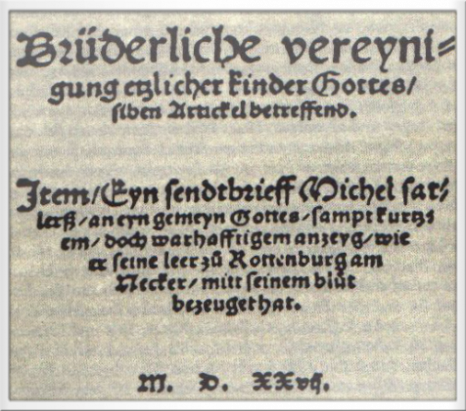 After the middle of the 16th century there was beside the Anabaptist movement a libertinistic group, the "Blood Friends," whom Justus Menius in his book, Von den Blutsfreunden aus dem Widertauff (Erfurt, 1551), associated with the Anabaptists; but the cross-examinations of the arrested "Blood Friends" revealed that they would have no part in adult baptism and attacked the teachings of the Anabaptists (Wappler, Thüringen, 190, 193, 205). Several "Blood Friends" were arrested in Mühlhausen in 1551, one of whom probably died at the stake, and others were banished from the city. This group caused the Anabaptist reputation irreparable damage in northern Thuringia. Hege, Christian and Christian Neff. Mennonitisches Lexikon., 4 v. Frankfurt & Weierhof: Hege; Karlsruhe; Schneider, 1913-1967: III, 173-175. Der Mythos, der sich im Volk um die Gestalten Thomas Müntzer und Heinrich Pfeiffer zu ranken begann, wird hier in der Aussage der tapferen Apollonia Kaiser deutlich. Diese unbekannte Heldin verrät niemanden aus ihrer Gemeinschaft. Lieber behauptet sie beim Verhör, sie sei für sich allein. 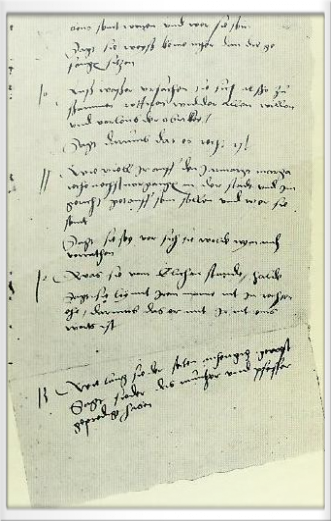 Aber gemeinsam mit dem Täufer Jakob Storger und weiteren Gesinnungsgenossen geht sie am 8.November 1537 in den Märtyrertod. Noch elf Jahre nach dem Bauernkrieg klangen den Herrschenden die Namen der Aufrührer Müntzer und Pfeiffer als viel zu gefährlich in den Ohren. Diese Gefahr sollte durch das gewaltsame Ertränken einer kleinen Gruppe von unpolitischen Wiedertäufern in der Unstrut vor der Stadt Mühlhausen gebannt werden. Selbst Frauen verschonten die Häscher dabei nicht.